A COOLING PRODUCT TO HELP YOU KEEP COOL IN THOSE HOT CONDITIONS WHEN YOU NEED TO BE ALERT FOR HUNTERS, FISHERMAN, PAINTBALL AND MILITARY SOLDIERS TO USE WITHOUT INTERFERING WITH THEIR DRESS AND UNIFORM CODES. THIS COOLING PRODUCT WILL HELP YOU KEEP COOL WHILE YOUR BEING ACTIVE. 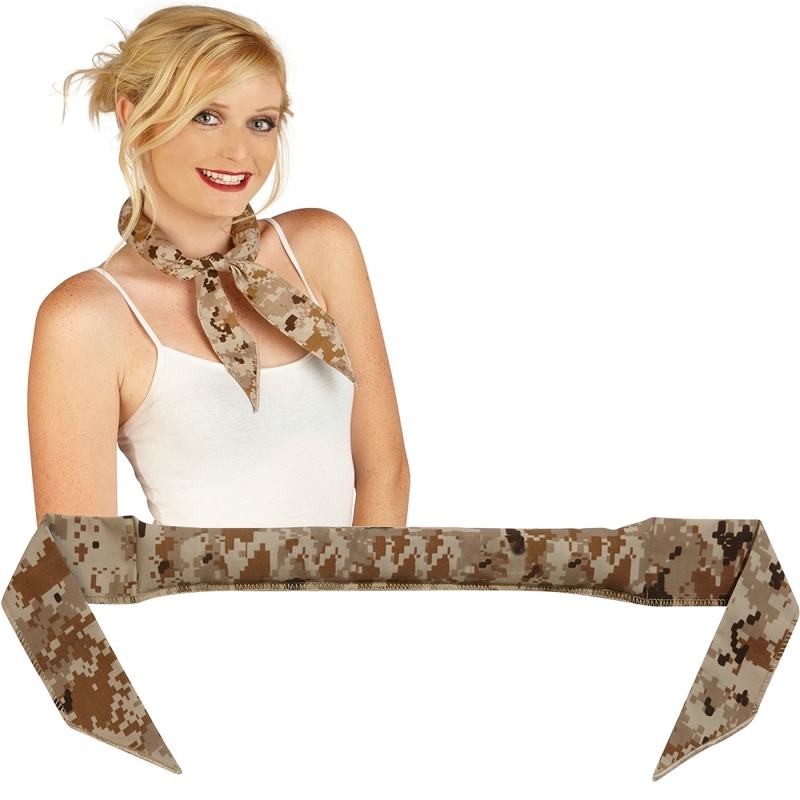 THIS NECK COOLER COOLING PRODUCT IS WORN AROUND YOUR NECK OR FOREHEAD AND APPLIED TO YOUR SKIN TO HELP YOU COOL DOWN FROM BEING IN THE HOT DESERT SUN AND OR CAN BE USED IN A HOT ENVIRONMENT LIKE A WAREHOUSE, BARIC, POST, TREE STAND OR AN ALL TRAIN VEHICLE THAT HAS LITTLE OR NO AIR CONDITIONING. A CHILL FACTOR PERFORMANCE COOLNECKWEAR PRODUCT IS ALSO NON-TOXIC, BIO-DEGRADABLE AND MADE IN THE USA. OTHER FABRIC CAMEO COLORS MAY BE AVAILABLE TO ORDER THREW OUR SUPPLY HOUSES SO CONTACT US IF YOU NEED THE CORRECT COLORS FOR YOUR MILITARY BRANCH OR NEED TO MATCH SOMETHING FOR YOUR HUNTING GEAR OR OUTFIT. these COOLNECKWEAR COOLING PRODUCTS ARE REUSABLE AND CAN BE AFTER THIS CHILL FACTOR PERFORMANCE COOLING PRODUCT IS ACTIVATED. OUR NECK COOLERS WILL ALWAYS BE 20F/5C COOLER THEN THE OUTSIDE AIR TEMPERATURE BEFORE ICE OR REFRIGERATION. THIS COOLNECKWEAR COOLING PRODUCT made from military nylon, cotton MIX MATERIAL so its thicker then our other products.INSIDE IS A BIODEGRADABLE SUPER ABSORBENT WATER POLYMER THAT'S NON-TOXIC THAT HELPS HOLDS TEMPERATURES FOR EXTENDED PERIODS THAT'S EASY TO USE AND CAN BE USED DAILY.